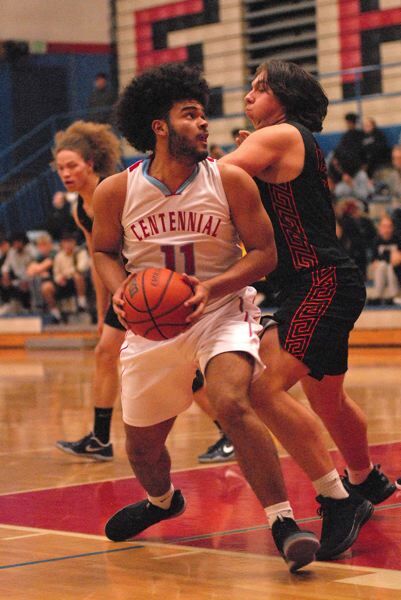 The Centennial boys basketball team came out of the halftime locker room with a renewed focus, but it wouldn't take Roseburg long to match the intensity and run away with a 77-55 win Tuesday night. 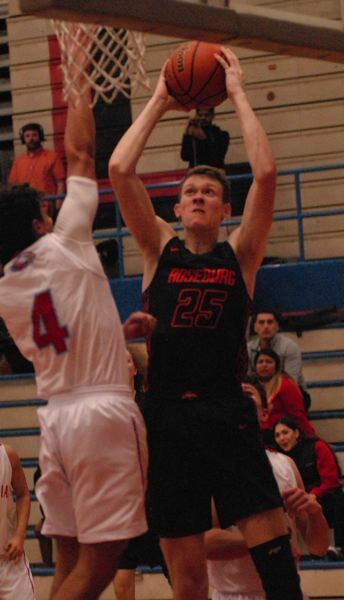 Roseburg stumbled back onto the court in the second half, starting out missing its first four shots, while also committing a turnover and an offensive foul. Meanwhile, the Eagles were clicking on their end of the court with Tommy Anderson feeding Andrew Caron for two points in the paint, followed by Jimmie Barton swatting away a pass and earning a trip to the free-throw line. Tommy Anderson knocked down a 3-pointer that had teammate Barton slapping the floor on the defensive end eager to keep the run going. He did just that with a trey of his own. Centennial had produced points on each of its first five possessions of the quarter, trimming a 16-point halftime deficit down to four and prompting Roseburg coach Mike Pardon to call timeout. The Indians came out of the huddle ready to respond with Kaden Seely sinking a 3 to end the dry spell. Roseburg would restore its lead to nine points heading into the fourth quarter and would quickly put the game out of reach. Center Jonathan Stone scored in the paint on back-to-back possessions, followed by Collin Warmouth driving into the lane and finding teammate Jett Black for a layup. Warmouth kept the ball on the next trip and came up with a highlight-reel dunk over the top of a defender for a three-point play. Roseburg was in command 55-37 with 6:04 left. Barton finished with a game-high 32 points, scoring 18 of them in the fourth quarter. Centennial plays at the Century/Hillsboro holiday tournament, beginning Thursday, Dec. 27. Roseburg raced to a 15-4 lead shortly after the opening tip, but Centennial got back to within five points thanks to the active play of Jalen Calvert on the boards. He created four scoring chances on one Eagles' possession that ended with Barton hitting a 3 from the top of the arc. The Indians answered with back-to-back 3s from Merhawi Lake, while teammate Storm Scott beat the halftime buzzer with a three-point play at the rim. Roseburg (77) — Jett Black 16, Storm Scott 16, Collin Warmouth 14, Merhawi Lake 9, Kaden Seely 9, Jonathan Stone 6, Zach Martin 3, D'Angelo Adams 2, Xavier Avilez 2, Ellis, J. Parker, M. Parker. Centennial (55) — Jimmie Barton 32, Tommy Anderson 14, Nate Caro 2, Jalen Calvert 2, Andrew Caron 2, Te. Anderson, Johnson, Estep.